This 53 minute full restorative yoga class is with a bolster, 2 yoga blocks, yoga strap, meditation cushion, folded blanket, chair and a wall. There is one standing hatha yoga posture in this class (Goddess Victory Squat) however it is used to gather energy. This restorative yoga class will help to relieve the effects of chronic stress and anxiety. Through the use of yoga props we will create a completely supportive environment for the total relaxation of your body, thoughts, energy, emotions, and spirit. We will begin with a gentle and restorative version of Apanasana or Knee to Chest Pose which is a fabulous yoga exercise to relieve constipation. From there we will move into Supta Padangusthasana or Hand to Big Toe Pose supported with a strap and blocks a yoga asana to release your hips and hamstrings. Child’s Pose or Balasana is one of the best yoga asanas to relieve back pain. Legs Up the Wall or Viparita Karani is a restorative yoga pose that benefits your lymphatic system and boosts your immune system. Fish Pose or Matsyasana is an excellent chest stretch. 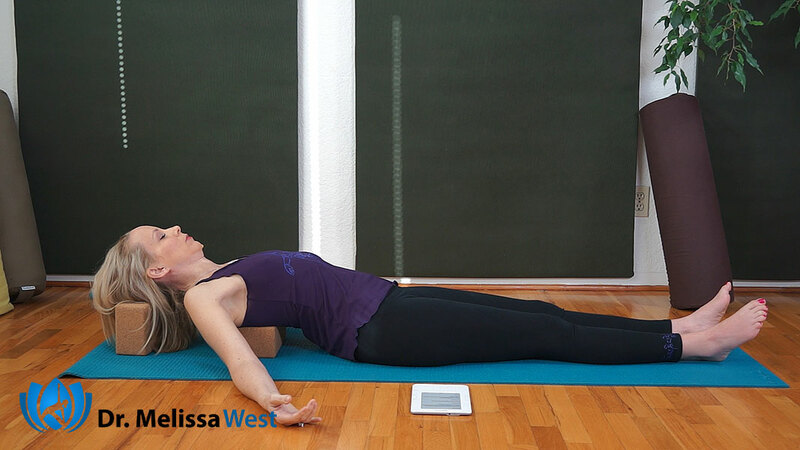 Front Lying Twist with Bolster is another restorative pose that you will love if you have back pain. We will finish with restorative Baddha Konasana or Bound Angle Breath Practice which helps to soothe menstrual discomforts. Our Pranayama or breath practice today is Left Nostril Breathing will help to slow you down and improve your sleep. We will finish with Savasana or Corpse Pose to integrate your practice calm your brain, relieve stress, anxiety, mild depression and relax your body. We are coming through a holiday season in Western culture where over consuming and over-activity are part of our daily landscape. Many of us have spent the last two weeks rushing around, staying up late, spending and buying more. Although the festivities can be fun this culturally imposed agenda is at odds with what is happening seasonally at this time of year. Winter is a time of year when nature is at rest. If you imagine a tree without its leaves all the energies have returned to its roots. 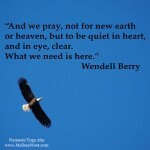 It is a good time for us to store our energy reserves and create a strong foundation. The cold and darkness of the season reminds us to conserve our energy and replenish our strength. It is a time of year for us to turn inward. During the winter season we can observe the hibernation of animals, a decrease in plant life, fewer daylight hours and cold weather. Just as many living organisms in winter hide, return home and enter into a resting period, we too can experience peace in our lives when our rhythms reflect the world of nature around us. 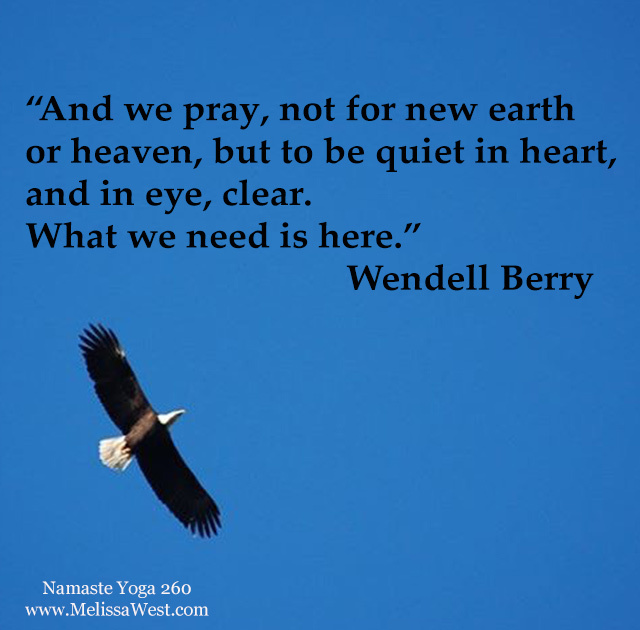 Now is a time to be still and quiet. How will you turn inwards this week? If you’ve resonated with any of these teachings or examples or if you want to have more guidance on moving inwards in winter, we have value added content on our membership site to support you and I invite you to become a part of our membership community. Yoga for your Kidney and Kidney Meridian, Yoga for your Bladder and Bladder Meridan, Yoga for the Kapha Dosha, Restorative Yoga for Your Adrenals, and a bonus restorative yoga class.